Renee Haltom has an interesting article in the recent edition of Richmond’s Fed’s magazine Region Focus on “Would a LITTLE inflation produce a BIGGER recover?”. Renee among other things discusses NGDP targeting – it is unclear from the article whether it is a reference to growth or level targeting and somewhat surprisingly Market Monetarists such as Scott Sumner is not mentioned in the discussion. Rather Renee Haltom has interviewed Bennett McCallum. Professor McCallum is of course the grandfather of Market Monetarism so Renee is forgiven for not mentioning Scott. So what Renee is basically suggesting is a that NGDP targeting would be fully comparable with the Federal Reserve’s mandate – to ensure price stability as well as to maximize employment. Unlike Scott Sumner I don’t think the Fed’s mandate is meaningful. The Fed should not try to maximize employment. In the long run employment is determined by factors completely outside of the Fed’s control. In the long run unemployment is determined by supply factors. In my view the only task of the Fed should be to ensure nominal stability and monetary neutrality (not distort relative prices) and the best way to do that is through a NGDP level target. However, lets play along and say that the Fed’s mandate is meaningful. In his 2001 paper “U.S. Monetary Policy During the 1990s” Greg Mankiw suggested that Fed’s policy reaction function (for interest rates) could be seen as a function of the rate of unemployment minus core inflation. Lets call this measure Mankiw’s constant. The clever reader will of course notice that we now capture Fed’s mandate in one variable. The graph below shows Mankiw’s constant and the ‘NGDP gap’ defined as percentage deviation from the trend in nominal GDP from 1990 to 2007 (the Great Moderation period). The graph is pretty clear – there is a very strong correlation between the Fed’s mandate and NGDP level targeting. If the Fed keeps NGDP on trend then it will also ensure that Mankiw constant in fact would be a constant and fulfill it’s mandate. The graph of course also shows very clearly that the Federal Reserve at the moment is very far from fulfilling its mandate. 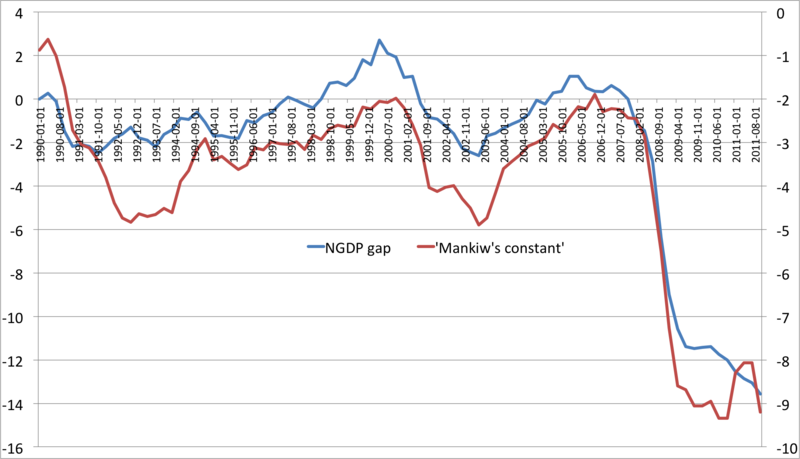 Given the very strong correlation between Mankiw’s constant and the NGDP gap it should be pretty easy for the Fed to argue that NGDP level (!) targeting is fully comparable with the Fed’s target. So Ben why are you still waiting? On the other hand, pointing out that NGDP level targeting and the current conception of the reaction function are so close also raises the question of what exactly is so special about NGDP level targeting. I’m personally sympathetic to NGDP level targeting, but I don’t understand why it’s treated as the be-all-end-all of monetary policy. Given the “very strong correlation”, why does it matter if they consider it compatible with their mandate or not? Or to put it differently – if policy that follows the Mankiw constant gives you the same result as policy that follows the NGDP gap, who cares whether we follow the NGDP gap or the Mankiw constant? Proselytizing one in the face of such a strong correlation just seems odd. Daniel, that is surely a good point, but what if we compared to the Taylor rule? Then the story is different. Furthermore, both the Taylor rule and the Mankiw rule suffers from problems in terms of structural changes and supply shocks. That might not be very relevant in recent US economic history, but if you look at Europe then it is pretty clear that structural unemployment grew dramatically in many countries in 1970s and 1980s. A Mankiw rule or a Taylor rule would not handle that well. Furthermore, think that some market monetarists – especially Scott Sumner and myself have stressed the need for making monetary policy market based through prediction markets/NGDP futures. That in my view is as important as the target itself. As Krugman often points out – that depends on which Taylor Rule we’re talking about! Excellent blog, and yes, the USA Fed is glacially, with much harumphing, and cracking of encrusted shibboleths, is coming to around to Market Monetarism. You have the problem of admitting error. Government organizations never admit error—think Vietnam or Afghanistan. It is better to move so slowly that people think you are responding to internal stimuli and greater wisdom, not what is obvious to everyone else. While Mankiw’s constant may also have led to the same conclusion as NGDPT – that monetary expansion is currently needed – the methodology applied to derive this conclusion is very differnt. Mankiw;s formula: Federal funds rate = 8.5 + 1.4 x (Core inflation – Unemployment) is basically saying there is a trade off between inflation and unemployment and, the only transmission mechanism is via the Fed targeting interest rates. The Market Monetarist view is that if the Fed targets NGDP and uses non-credit based transmission mechanisms then the market will take care of the trade off between inflation and unemployment and the interest rate will adjust to its natural level. I think the question of which one is chosen as the mandate is not a trivial question as Daniel suggests but is tied into questions about the kind of economy we want to have. You got that completely right. Market Monetarism is certainly a lot more than a discussion about the target of the central bank. The understanding of money and the monetary transmission is certainly quite different from what New Keynesians like Mankiw, Taylor and Krugman (yeah they are all New Keynesians) think. Has Bernanke Finally Done It?